In all the heated and passionate discussions surrounding the ethics of human enhancement, it's rare to hear anyone argue from the perspective of justice and the protections of law. Rather, we're fed our daily bread of eloquent and well-articulated arguments based on abstractions, admonitions and abominations. Mercifully, most of our legal traditions are informed by reason and sound argumentation. Much of the fairness and non-arbitrariness found in modern legal systems, including the civil liberties we all take for granted, cannot be appreciated outside the context of our jurisprudence, the so-called "science of law." I tend to be frustrated, therefore, with those who ignore the realms of law and justice when arguing against such things as human enhancement. I often wonder how many legislators or lawyers would actually have the nerve to stand before a panel of judges and complain that something should be outlawed because it feels yucky. I am, of course, being overly simplistic. At any given time, a myriad of factors contribute to a given body of law, including historical legacies. Today, nearly all discussions about reengineering the human species are met with comparisons to eugenics, and legislators are listening. Thankfully, there are some bioethicists who, in their discussions of human enhancement, recognize the need to address issues of social justice while also acknowledging the need to reevaluate perceived skeletons in humanity's collective closet. 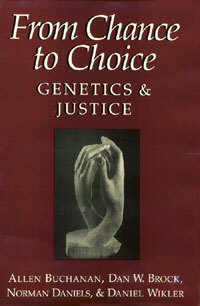 In 2000, four such ethicists—Allen Buchanan, Norman Daniels, Daniel Wikler and Dan Brock—penned a very important book that specifically addressed the ethics of genetic enhancements in consideration of upholding principles of justice and fairness to the highest and safest degree. The book, From Chance to Choice: Genetics and Justice, takes a thorough, methodological and pragmatic approach to the issues surrounding germinal choice, resulting in some extremely surprising, challenging and important conclusions. After laying down some groundwork in the first chapter, Buchanan et al embark on the commendable task of dissecting the eugenics phenomenon. The second chapter, "Eugenics and its Shadow," contains an excellent overview of eugenics—its origins, history, political and cultural manifestations, and the varying interpretations of the term. The authors also discuss the social tendency towards eugenics and draw direct analogies to historical and contemporary conceptions and agendas surrounding issues of human enhancement. Ultimately, five different theses are proposed in an attempt to answer the crucial question, "Why is eugenics wrong?" Unsatisfied with virtually all the arguments, the authors argue that eugenics can only be considered wrong in the context of state control and the imposition of social injustice upon citizenry. As the authors correctly point out, the term "eugenics" is bantered about so often these days it has entered into the rhetorical, a pejorative stripped of its meaning. Indeed, at its very core, and from the context of social justice, eugenics only exists as a problem when practiced by the state to control the reproductive processes of its citizens. As the authors note, "We can reject the eugenicists' notions of what is just without disavowing the possibility of using genetics to achieve greater justice." Bioethicists, consequently, have the significant responsibility of detecting where harm is imparted by a particular reproductive procedure. The authors make it very clear from the outset that reproductive freedoms are a critical component of civil liberties and human rights. Much of their thinking was influenced by ethicist John Robertson, author of Children of Choice: Freedom and the New Reproductive Technologies, who put forth the argument that reproductive freedoms—so-called "procreative liberties"—are a vital civil rights issue. The establishment of this theme—the importance of social justice—effectively sets the tone for From Chance to Choice, allowing the authors to critically examine the morality and validity of genetic interventions and human enhancement. The authors go on to discuss such topics as positive and negative genetic interventions, reproductive freedoms and the prevention of harm, and conclude with sensical policy recommendations. Like the good ethicists that they are, Buchanan and company explore the broader themes of distributive justice that are necessarily a part of altering genetic constitutions. Novel germinal choice technologies, they argue, have thrust the human genome alongside other resources at our disposal. Consequently, they address issues of Rawlsian distributive justice and conclude that resource egalitarians, in order to remain consistent, must include genetic interventions in the resource pool. "Resource egalitarians," they write, "appear committed to the thesis that justice requires direct interventions in the natural lottery, and not just to prevent or cure diseases, whenever doing so is the best way to achieve an overall equality of resources." In other words, because of our pending control over our genetic constitutions, and because our biological characteristics play a significant role in how we are able to both function and actualize ourselves in society (not unlike the way our access to wealth and education works), we must be concerned about ensuring that as many people as possible have a right and access to germinal choice technologies in the name of justice and fairness. Overall, From Chance to Choice is a historically important work that all thinking bioethicists should read. It will be a particularly interesting read for transhumanists—those who embrace human-enhancing technologies. While the authors never explicitly advocate a "transhuman" future, they come awfully close at times. Consequently, most transhumanist ethicists should have very few qualms with this work. For example, say the authors, "We may either underestimate or overestimate our eventual powers to change ourselves." They continue, "If we underestimate, then once the limitations of our imagination are revealed, we may come to revise our conception of human nature." In turn, they argue, if we come to regard the constraints of our "nature" as rather negligible, as our ability to change ourselves increases "we may then focus directly on what sorts of characteristics we want our lives and the lives of our offspring to have, whether they are human lives or not." In some respects, argue the authors, this would be all to the good "since there was never very much to be said for the view that what is important about us, morally speaking, is that we are human beings as opposed, say, to sentient beings or to beings who combine sentience with rationality." They argue that, "Appreciation for the fungibility of DNA, the consequent malleability of life, and the permeability of so-called species barriers thus may add impetus to the efforts of animal rights activists to rid our moral theorizing of parochialism." And eventually, given enough changes and varying routes of human speciation, "Perhaps future members in the United Nations will become increasingly uncomfortable with the phrase 'Universal Declaration of Human Rights.'" While realistic and forward-looking in most respects, however, the book does have some minor irritations. One if its primary shortcomings is a fixation and singular focus on genetic technologies. Yes, in the era of human redesign, genetics will be a major player, but hardly the only one. It's easy to get caught up in the excitement following the successful mapping of the human genome, but other technologies that could have been addressed include neuropharmaceuticals, cybernetic implants and medical nanotechnology. In all fairness, however, because germinal choice technologies are all but upon us, we must start formulating public policy in regards to them now. Moreover, the methodology used to decide the ethics of genetic modifications is transferable to other enhancement technologies. And of course, the book will also be challenging to most traditional and conservative bioethicists in that the authors advocate a soft form of eugenics and favor human enhancement. They cogently argue that it is implausible for public policy to draw a line that allows people to use genetic technology for treatments but prohibits them from undertaking enhancements. "Through its democratic processes, a liberal society could decide to devote resources to the continual enhancement of desirable human characteristics—to embark on a process of genetic perfectionism—so long as in doing so it did not compromise its commitment to justice and the prevention of serious harm," they argue. Such a policy, they say, need not infringe on anyone's reproductive freedom if, for example, "it only encourages rather than coerces or unduly pressures prospective parents to use enhancement technologies." In other words, the authors conclude, a just society in which where there are substantial enhancement biotechnologies can have a public policy of eugenics—in the broadest sense of the term—while maintaining social justice and improving human beings. Conclusions such as this will keep From Chance to Choice on the lips of bioethicists for years to come. Tags: bioethics, law, justice, human genetics, human enhancement, transhumanism.